It's impossible to capture the breathtaking beauty of the scenery with a single photo here and there.  Putting three photos together like this helps, but not much! 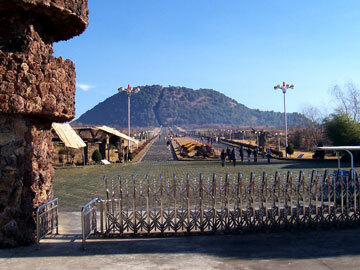 This was taken from the side of the Da-Kong-Shan volcano. The school hired this coach to take us from Kunming and back. We traveled all day Friday and all day Sunday, with educational sightseeing all day Saturday. 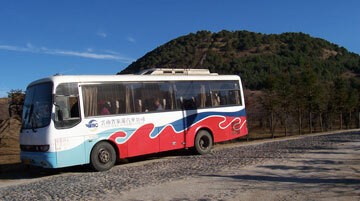 Here, the bus is parked in front of Da-Kong-Shan volcano. We were impressed with the first-class facilities (including the rest rooms!) at both of the National Parks we visited (here and Re-Hai). But China is not the place to visit if you don't like stairs! (right) We walked over a mile from the entrance of Da-Kong-Shan Park to the base of the volcano, and then there were about 300 steps to take you to the top (where you could descend into the crater). This is one of five volcanoes (along with other natural features) in the Kong Shan Volcano National Park. There are 20 or so volcanoes in the area, which has also experienced over 70 major earthquakes in the past 500 years. I should also note that, due to its altitude of 1650m, it reached zero (C) at night but the kids were walking around in t-shirts at midday. Along the road there were a cluster of interesting brick kilns. Unlike the US, where bricks are mainly used for decoration, Chinese bricks are an important building material. You can see more kilns in the background. Those who travel in China also see all manner of vehicles. Most are mechanical but we saw a number of horses, donkeys, cows and water buffalo on this trip. The presence of slow-moving-vehicles on narrow two-way roads is another reason for the long hours en route. 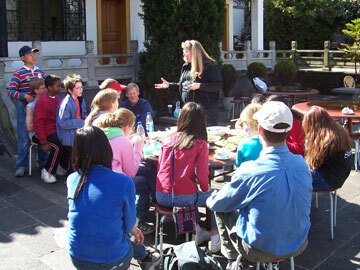 Since it was an educational trip, the teachers took time to explain things when needed. The students also had to fill out a few work sheets. This is at the restaurant where we got four delicious meals. Here's another composite photo, this time looking over the Bei-Hai marsh. Visitors who have the time can take small boats into the glades. They say the area is beautiful in the spring when all the orchids are blooming. I don't have any photos of the beautiful new city streets in Teng Chong. 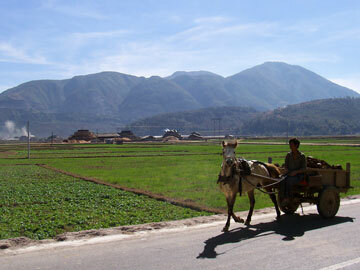 Apparently the government is working hard to encourage tourism to this remote area, only a few kilometers from Myanmar. Another project is the rebuilding of an airport used by the Flying Tigers of World War II (along with a museum, scheduled to open in 2007). This was one of the first cities on the Chinese side of the "hump," and American pilots flew vital supplies over this dangerous air-route to help their Chinese comrades resist the Japanese. Another major stop was Re-Hai Hotsprings National Park. Mineral-rich boiling water spews from the earth, and if you have the time (and money) you can even swim in it. 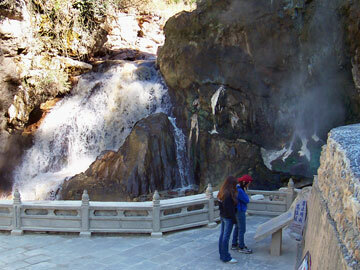 Again, there were lots of steps, nice facilities, and lots of beautiful views of flowing or steaming water. 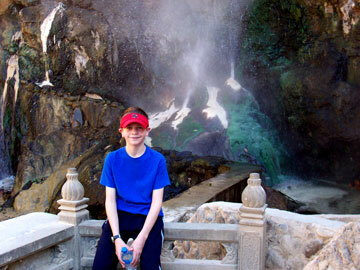 Andrew is sitting in front of a geothermal feature (also seen in the left-hand photo) called "the frog" because of the color produced by the minerals and temperature of this geyser. Accidents happen. 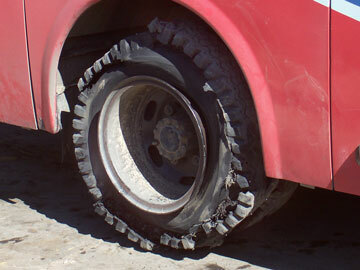 We had a great bus driver, but the bumpy roads and construction are bound to take their toll. 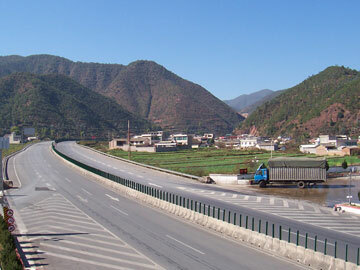 Both tires blew, and the rest area (providentially only a few hundred meters from the blowout) didn't have the right size, so we experienced a two-hour delay, waiting for a bus to take us to Dali and then another bus to get us back to Kunming.